Well, that was quite a day. I am writing this from the train back home before my brain switches off for the day. I have titled this “being the new student”, although I have spent all day with other new students, I have realised that unlike other degrees the PhD journey is a very individual one. Or at least that is what they have been telling us today. Today was PhD Induction Day. I met my fellow cohort, the directors of the research team, other PhD students further along in their journey and my very own supervisor. They throw a lot of information at you on the first day. Some of it sticks. I am going to predict that the rest of it is in the handbook. Things being in the handbook was one of the messages that stuck. Another things that stuck is that Neville the cat is adorable. Later on I will go through my notes and see what important things I wrote down, and then go through the handouts to take those in again as well. I think that the important things I took away with me are that there are others on their very individual journey as well. Don’t isolate them as they aren’t experiencing the same issues as you or don’t quite understand your topic. Get involved, best foot forward and begin by reading, reading, reading. At least that is what I am going to do until my next supervisory meeting. I did meet my supervisor briefly, I am pleased I made the time as she is enthusiastic about my work. I left with a book to read and a feeling of her excitement about my project and how her other students will benefit from my expertise and I will benefit from them, as well as hers. It is a different feeling from being a taught student, a refreshing change and one I think I am going to enjoy (even if it takes a while to adapt). On top of the book, I left Sheffield with a t-shirt and a new student card. The first big step has been taken! 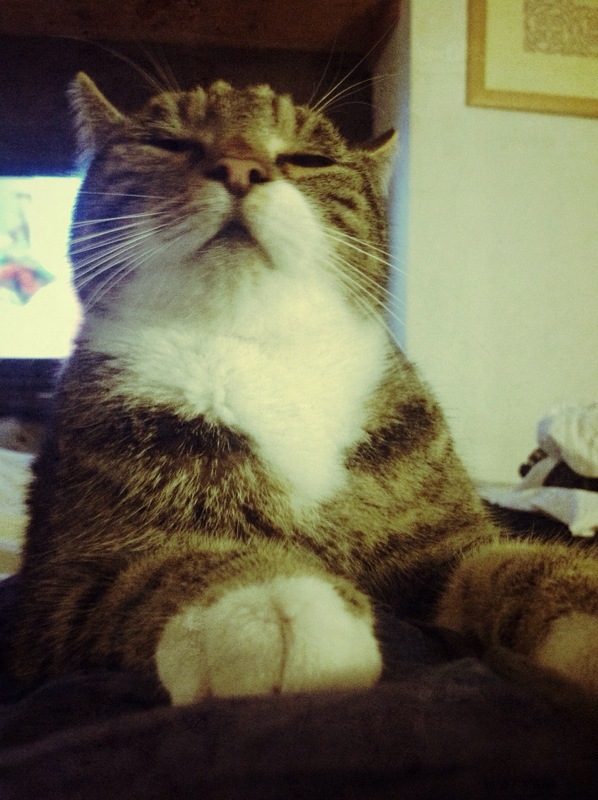 So as usual, cat picture (not Neville), but the smug face of Fatty.